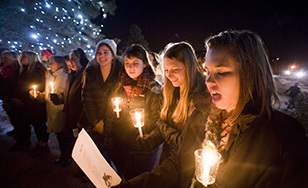 The public is invited to celebrate the start of the Christmas season at St. Scholastica's annual "Lighting a Tradition" event at 5:15 p.m. Tuesday, Dec. 1. After the traditional Advent Vespers service at 4:30 p.m. in Our Lady Queen of Peace Chapel on campus, people are invited to gather at the front steps of Tower Hall for a countdown to the lighting of the Christmas trees in front of the iconic campus building. Afterward, participants enjoy hot cocoa and cookies in the Tower foyer. The event is sponsored by the Student Alumni Association. With Christmas carols and plenty of holiday cheer, these free events mark the official start of the season for the St. Scholastica campus. For more information contact St. Scholastica's Alumni Relations office at (218) 723-6071 or alumni@css.edu.